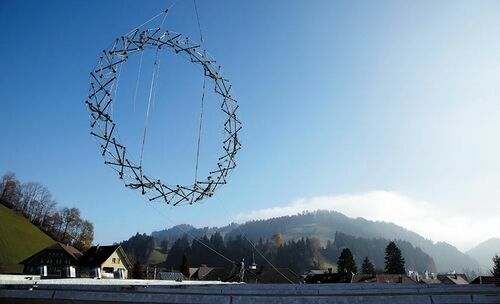 Jakob AG, a Swiss rope-system manufacturer, decided to construct a large Tensegrity Torus in 2006. Architect Filippo Broggini was commissioned, with Blue Office Architecture. Production and assembly was implemented by Jakob employees. The wheel construction stands outside the Jakob's factory. Jakob Tensegrity Torus being lowered into place from a crane. An early model of the torus was constructed from children's glostick toys. 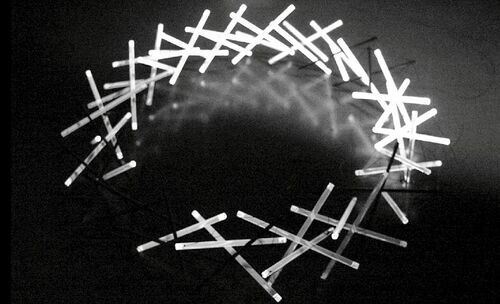 Jakob Tensegrity Torus model made from toy glosticks.